Diagnosis: Chronic medical conditions cost the health-care system billions of dollars. Prescription: Now patients can avoid the hospital by monitoring their condition at home. (Business 2.0 Magazine) -- Bill Halcomb's three-times-a week sessions at a local dialysis center used to consume a total of 15 hours, depriving him of time to run his kidney patient website, Ihatedialysis.com. Now the 34-year-old Southern California man says he's reclaimed his life by controlling his treatment with a new portable home dialysis machine. "Here at home I have my laptop and my Wi-Fi, and while the machine is running, I'm working," he says. 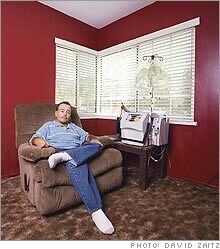 Dialysis on demand: Bill Halcomb's home machine could save Kaiser $20,000 a year. Thanks to the advent of technology for treating and monitoring chronic diseases, Halcomb's new routine is becoming far less unusual. And it's not just patients but also insurers that are driving the trend, looking for a way to slow the spiraling health-care costs of common conditions. Diabetes and heart and kidney disorders alone account for a staggering 75 percent of the nation's medical bill. Health-care giant Kaiser Permanente, for instance, pays for Halcomb to use the suitcase-size dialysis machine rented from Lawrence, Mass., company NxStage for $1,500 a month. Kaiser figures it can save as much as $20,000 a year by allowing a patient like Halcomb to treat himself. The market for home dialysis is potentially huge: Nearly all of the nation's 325,000 dialysis patients are currently treated at medical centers, at a cost of about $300 million annually. NxStage (Charts) just began selling its System One machine for home use a year ago, and revenue jumped 348 percent to $2.7 million in the company's latest fiscal quarter. "It was an unmet market," says NxStage founder and CEO Jeff Burbank, "and the patient response has been overwhelming." Analysts estimate that the market for home medical monitoring for chronic conditions could be worth as much as $500 million a year by 2009. And demand will only increase: The graying of the baby boom generation will double the elderly population between 2011 and 2030. Health Hero Network, a privately held Redwood City, Calif., company founded in 1998, is one of more than half a dozen firms making interactive devices to remotely track patients at home. The goal: head off medical crises by reviewing patients' vital signs daily and reminding them to take their medications. A bit bigger than a PlayStation Portable, its Health Buddy features four buttons, a screen, and ports for scales, glucose meters, and blood pressure monitors. "How do you feel today?" the Health Buddy asks in the morning, prompting a congestive heart patient to weigh herself and check her blood pressure. The Health Buddy then transmits the data to the patient's health-care provider. If the device detects elevated blood sugar levels, for instance, it tells the patient to call her physician. Some 10,000 Veterans Affairs patients use the monitoring system. Health Hero won't give specific financial information but says its revenue doubled in 2005. The Health Buddy is now sold in drugstores, and Health Hero has also teamed up with iCare Health Monitoring, a Golden, Colo., disease management company. People pay $99 for the device and $50 a month to iCare, which monitors their vital signs and alerts their doctors and relatives when potential problems arise. Health Hero VP Gary Paladin calls it the "guilty daughter market." Adult children who live far from their parents can log on to iCare's website to make sure Dad is taking his meds and isn't indulging in too many Krispy Kremes. "There's a huge opportunity here, and the market is just being developed," says health-care industry consultant Greg Malkary of Spyglass Consulting. The next generation of home monitoring technology is already being developed to serve that emerging market. Chicago's Carematix is building wireless transmitters into glucose meters and other devices. When a patient steps out of the shower and onto a Carematix scale, his data is beamed to a wireless router. Veterans Affairs patients now use the system, while other VA home-care patients check in with a video-equipped gadget made by ViTel Net of McLean, Va. Meanwhile, Mike Sloma, owner of dialysis centers in upstate New York, is working with NxStage to modify its dialysis machine so he can remotely check on his clients. "It will give patients and caregivers peace of mind knowing that, in some sense, someone is always there," Sloma says, "and they'll take more responsibility for their own care." Maybe it'll even help them stick around long enough to see the dawn of Health 3.0. The Gene Screen Online genetic-testing services are springing up to take advantage of advances in genomics - and the growing willingness of consumers to conduct their most personal business over the Internet. Retail Therapy More people are adding health care to their shopping lists as walk-in medical clinics are popping up in Wal-Marts, drugstores, and other retail outlets. A Second Opinion for Medical Bills As the number of people paying for medical treatment through health savings accounts soars, software services that help them manage bills and spot errors are on the rise. Steps to a Healthy Medical Startup We've identified ways savvy entrepreneurs like you can profit from Health 2.0. A hint? If you lack in-depth knowledge of the health care industry, don't be afraid to partner with someone who's got what you need. That's what AOL founder Steve Case did.